Held at 7:30 p.m. on the second Friday of each month (except December) at St. John�s Lutheran Church, southwest corner of 47th Street and Brainard Avenue, La Grange IL; enter through south side door adjacent to parking lot. Digital SSTV (Slow Scan Amateur TV) Net, Thursday evenings at 7 p.m. on our two meter repeater, using EasyPal software. The Club operates three open repeaters under the call K9ONA/R. Our Two Meter repeater, located in Hinsdale, uses 146.370 MHz input, 146.970 MHz output, with a three minute timer that must be reset with a short pause after the courtesy tone between transmissions. A 107.2 Hz subaudible (PL) tone is usually required for access. Our 220 repeater, also located in Hinsdale, uses 223.22 MHz in, 224.82 MHz out and requires a CTCSS tone of 110.9 Hz. Our UHF repeater, located in Hinsdale as well, uses 448.300 MHz input, 443.300 MHz output, a four minute timer, and is also �PL� access, requiring a 114.8 Hz tone. The two meter and UHF repeaters also transmit the subaudible CTCSS tone. The repeaters are usually set in cross-link mode. The Club is a Life Member Club supporting AMSAT, the non-profit Radio Amateur Satellite Corporation. We have been named an ARRL-affiliated Special Service Club - receipent of ARRL's Maxim Award, and belong to the Illinois Repeater Assn. Available for working ten Club members (five if applicant is more than 100 miles from Chicago) on either 50, 144, or 222 MHz. Stations worked must be valid Club members at time of your QSO; repeater contacts do not count. Send log data list with time, date, and band/mode to our Secretary. There is no charge for the award. The Club has endowed a perpetual scholarship administered by the ARRL Foundation. It is awarded annually subject to specific criteria listed on the ARRL web site, www.arrl.org, or available from the foundation. Applications are due by January 31 of each calendar year. The Club�s Facebook page is available at: www.facebook.com/groups/287932964607477/. The Yahoo Group can be accessed at: http://groups.yahoo.com/group/K9ONA. 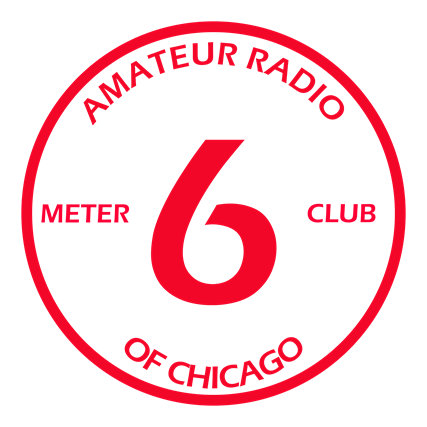 Our Six Meter Club of Chicago HAMFEST is held annually on the third Sunday in June (June 17, 2018) at the DuPage County Fairgrounds in Wheaton IL. All Club members are expected to work to insure its success.